Jesus addresses himself lovingly to you, sons and daughters of this blessed land, in which the seed of the Gospel has been sown for over a thousand years. Your country, like other nations, is experiencing cultural conditions that often present a radical challenge to faith and therefore also to hope. In fact, in the modern age both faith and hope have undergone a "shift", because they have been relegated to the private and other-worldly sphere, while in day-to-day public life confidence in scientific and economic progress has been affirmed (cf. Spe Salvi, 17). We all know that this progress is ambiguous: it opens up possibilities for good as well as evil. Technical developments and the improvement of social structures are important and certainly necessary, but they are not enough to guarantee the moral welfare of society (cf. ibid., 24). Man needs to be liberated from material oppressions, but more profoundly, he must be saved from the evils that afflict the spirit. And who can save him if not God, who is Love and has revealed his face as almighty and merciful Father in Jesus Christ? Our firm hope is therefore Christ: in him, God has loved us to the utmost and has given us life in abundance (cf. Jn 10:10), the life that every person, even if unknowingly, longs to possess. At times one cannot help noticing, with a certain nostalgia, that the pace of modern life tends to diminish some elements of a rich heritage of faith. Yet it is important not to lose sight of the ideal expressed by traditional customs, and above all to maintain the spiritual patrimony inherited from your forebears, to guard it and to make it answer to the needs of the present day. May the Virgin Mary assist you in this, as we renew the entrustment to her of your Church and of the entire Czech nation. Precisely because the Gospel is not an ideology, it does not presume to lock evolving socio-political realities into rigid schemas. Rather, it transcends the vicissitudes of this world and casts new light on the dignity of the human person in every age. Dear friends, let us ask the Lord to implant within us a spirit of courage to share the timeless saving truths which have shaped, and will continue to shape, the social and cultural progress of this continent. The idea of an integrated education, based on the unity of knowledge grounded in truth, must be regained. It serves to counteract the tendency, so evident in contemporary society, towards a fragmentation of knowledge. With the massive growth in information and technology there comes the temptation to detach reason from the pursuit of truth. Sundered from the fundamental human orientation towards truth, however, reason begins to lose direction: it withers, either under the guise of modesty, resting content with the merely partial or provisional, or under the guise of certainty, insisting on capitulation to the demands of those who indiscriminately give equal value to practically everything. The relativism that ensues provides a dense camouflage behind which new threats to the autonomy of academic institutions can lurk. While the period of interference from political totalitarianism has passed, is it not the case that frequently, across the globe, the exercise of reason and academic research are – subtly and not so subtly – constrained to bow to the pressures of ideological interest groups and the lure of short-term utilitarian or pragmatic goals? What will happen if our culture builds itself only on fashionable arguments, with little reference to a genuine historical intellectual tradition, or on the viewpoints that are most vociferously promoted and most heavily funded? What will happen if in its anxiety to preserve a radical secularism, it detaches itself from its life-giving roots? Our societies will not become more reasonable or tolerant or adaptable but rather more brittle and less inclusive, and they will increasingly struggle to recognize what is true, noble and good. 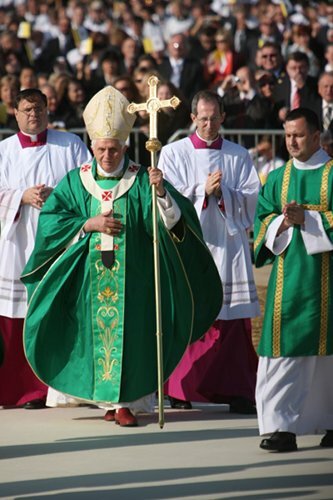 Be sure to stay tuned to our ongoing coverage of Pope Benedict XVI’s Apostolic Journey to the Czech Republic. On Monday, September 28th, in what may be the highlight of the trip, the Holy Father will celebrate Holy Mass on the feast day of St. Wenceslaus, a patron and national hero of the Czech Republic.